Heavy steel frames designed for durability. Easy-to-clean polypropylene helps eliminate static. Nylon glides. Matching colored legs. Height #1 Sitting Popliteal Sitting Popliteal is defined as the height from the floor to the back of the knee while seated. To provide correct ergonomic seating, the child should be sitting comfortably with feet flat on the floor and knees bent at right angles. 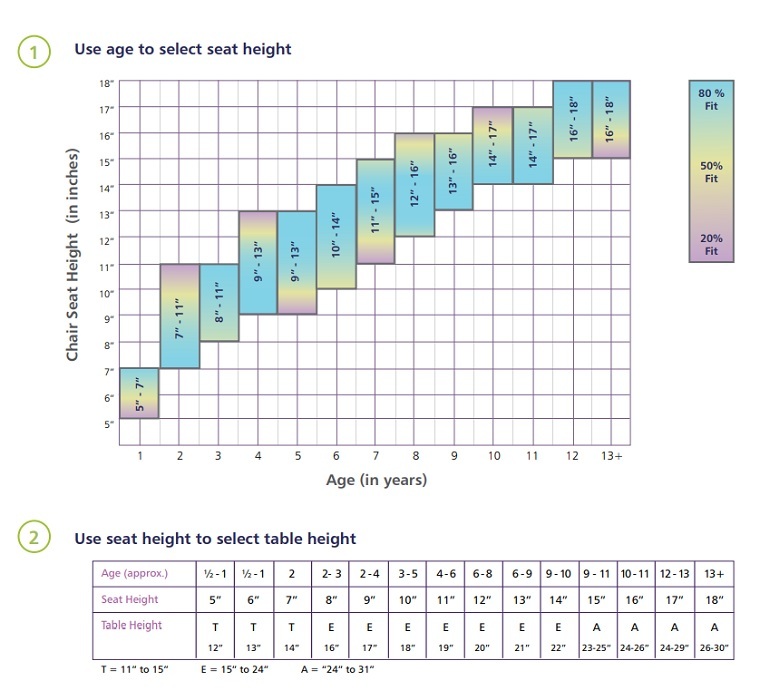 The correct seat height will be the measurement from the floor to the bend behind the child’s knee. Height #2 - Table Clearance Table clearance is defined as the height from the top of the leg to the bottom of the table. Usually, tabletops should be 8 inches from the top of a child’s thigh, although this height might be slightly less for toddlers. When deciding on a table height, you should take into consideration the child’s overall size and build. 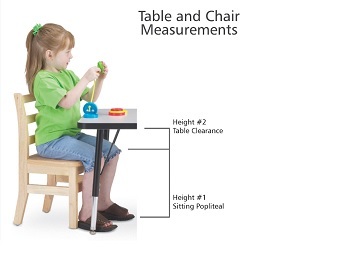 For example, a short waisted child will be more comfortable at a shorter table in relation to his or her seat height. Special Considerations When picking out tables you should also consider any special needs children that will be using the classroom furniture. If a child is in a wheelchair that does not have a built-in desk feature, they will need a table in the classroom that is high enough for them to sit at comfortably. Licensing and accreditation regulations may also play a role in which table size is appropriate for your students. The below graph and chart are based on average recommendations from several sources and should be used as a guide. By measuring the child as directed above, you will ensure the best fit possible. If measuring the child is not practical, use this chart as a starting point. Consider whether the child’s build id bigger or smaller than other children of the same age. 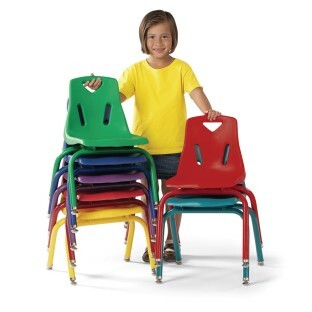 If you are still unsure what size chair to order, go to the next size up to give your child room to grow! Step 3 After you've completed Steps 1 & 2 below, click here to shop for your table. Berries™ feature heavy steel frames and child-friendly comfort seating. Polypropylene is easy to clean and helps eliminate static. Nylon glides. Matching colored legs. 5-year warranty. 16". Please specify Red, Yellow, Blue, Green, Purple or Orange when ordering.